Be the first to share your favorite memory, photo or story of Joseph. This memorial page is dedicated for family, friends and future generations to celebrate the life of their loved one. 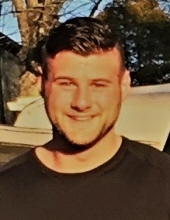 Joseph Michael Sullivan, 25, of Whitesboro, passed away April 3, 2019, in Delray Beach, FL, after a ten year battle with addiction. He was born October 18, 1993, in New Hartford, NY, the son of Dan and Christine (Philip) Sullivan. Joe was a graduate of Whitesboro High School, class of 2011, and continued his education at MVCC. Mr. Sullivan worked in construction, and had been accepted into the apprentice electricians program with IBEW Local 43. He was a member of St. Paul’s Catholic Church in Whitesboro. Joe had a love for his family, wrestling, weight lifting, the water, and his dogs. Joe was blessed to carry his father’s traits of wit and sarcasm, and his mother’s, and sister’s, love for people. His presence filled every room he entered and he had a tender and gracious heart. Joe wore the scars of criticism quietly but was always forgiving. He treated all people with love without judgement. Joe will be deeply missed by everyone he touched but will always being lovingly remembered. He is survived by his beloved parents, Dan and Chris; his sister, Maria Sullivan; maternal grandmother, Connie Philip; aunts and uncles, Sharon and Dwayne Wisbey, Kathy and Chuck Pederson, Barbie and Sal Nicolette, John and Deborah Sullivan, James and Roberta Sullivan, Ann Marie Sullivan, Thomas and Nancy Sullivan, Eileen and Tom Dutcher, and John Roberts; many cousins whom he loved dearly; and several friends. He was predeceased by his maternal grandfather, Ralph Philip; paternal grandparents, John and Mary Sullivan; aunts and uncle, Maureen and Larry Sullivan, and Margaret Roberts; and a cousin, Sean David Roberts. Calling hours are Wednesday from 4:00-7:00 pm, at Dimbleby Funeral Homes, Inc., 40 Main Street, Whitesboro. His Funeral Mass will be celebrated on Thursday, 12:00 pm at St. Paul’s Catholic Church, 16 Park Ave., Whitesboro. Interment will be in St. Stanislaus & St. Casimir Cemetery. Those having a Mass offered in Joe’s name will be greatly appreciated by his family. Those wishing to make a monetary contribution in his honor, please consider Mother Marianne’s West Side Kitchen, c/o St. Joseph-St. Patrick Church, 702 Columbia St., Utica, NY 13502, in lieu of flowers. To plant a tree in memory of Joseph Michael Sullivan, please visit our Tribute Store. "Email Address" would like to share the life celebration of Joseph Michael Sullivan. Click on the "link" to go to share a favorite memory or leave a condolence message for the family.